Guess who that is ripping into the fish? 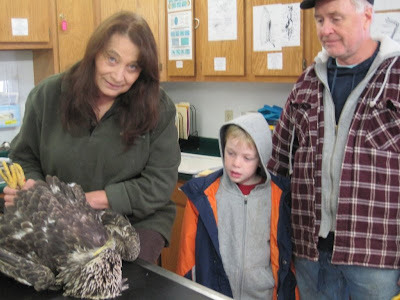 Yup, we are delighted to say that it is the male Bald Eagle that was trapped on the Wisconsin River and found a week ago today. 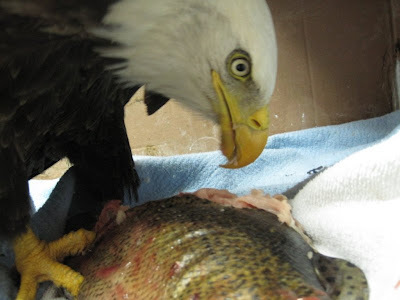 It is very good news that the trapped Bald Eagle has made great progress. He is still fighting pneumonia. That fact alone makes him still a critical case. We are trying hard not to get too excited! He has not had solid food or eaten on his own since admission. He has however gained 1 lb. 5 ozs. That speaks well of REGI staff that tube fed him liquid food and gave supportive around the clock care the past week. We are going slow on solid food, but he is eating beef heart strips. He has started to flap those very battered wings. Keep those positive thoughts coming his way. As I write this blog I am struggling how to identify individual birds in conversation. Before the blog it was not an issue. All birds in rehabilitation have a patient number. They are referred to by their number ( however affectionately) or are called by the place they came from. 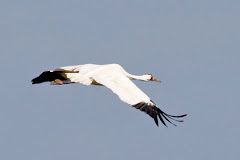 But, before the blog we talked to each other (staff) about the birds and not the public. We've never "named" patients if they are releasable. Our policy has been it sends the wrong message to the public. USFWS, the federal agency that issues our permits feels that way too. The birds are not "ours". Naming them kind of indicates they are. The problem is we currently have fifteen Bald Eagles in, three admitted this week. I am not sure how to explain each? I would love some input from our blogging public. We sometimes identify with location. We could call the trapped Bald Eagle, Grandfather Falls since he was found near that location. We could call him Tomahawk since he was found near that town. I will wait for some ideas from you folks. As I continue writing today you will see it is getting complicated. Ken and his grandson witnessed the eagle hit by a car. Traffic was fast approaching. Quick thinking Ken sprang into action to prevent further injury to the eagle. He carefully moved the eagle off the road until he could get gloves and a jacket to wrap around the big bird. He called REGI and drove the eagle directly to us. They arrived about an hour ago. 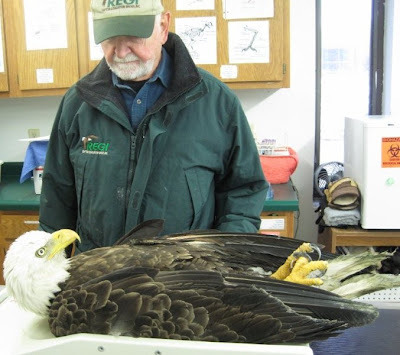 While we don't normally encourage the public to handle a Bald Eagle, there is little doubt that Ken saved this eagles life. He was also a great role model to his young grandson. Too many people in this world think it is the responsibility of "someone else" to do everything. Stepping up to the plate in a situation like this is inspiring! Thanks Ken! 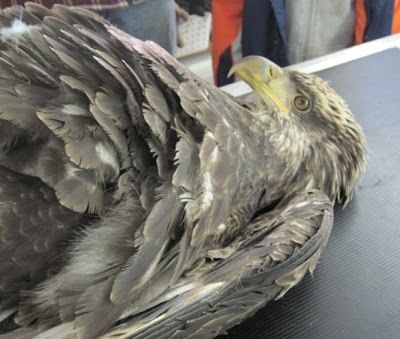 The eagle has some internal bleeding and a possible spinal injury. We will not know how severe the injuries are for a few days. As I write this however, Katie stopped in to say he was trying to stand. 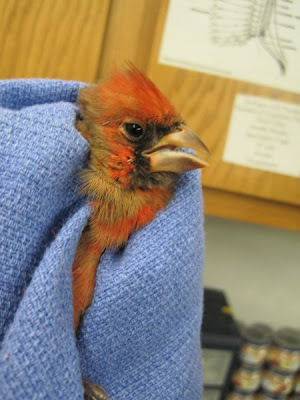 A young male Northern Cardinal was admitted late yesterday afternoon. He was attacked by a cat. Cat bites are serious stuff for birds. If they are to survive they need antibiotics ASAP. Fortunately, that is exactly what happened in this case. The homeowner picked her up and got her to REGI. This morning...no kidding...he is singing. It will be awhile before he is released. He lost tail feathers in the incident. They have to grow in. He is in a heated cage and will remain on antibiotics for a week, but I think he will live to see another spring. 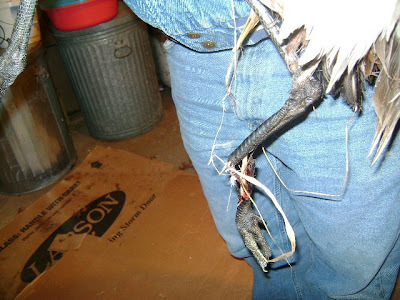 Our sad news is an adult Sandhill Crane was caught in a leg hold trap near Arpin. The leg was crushed and the bone infected. We had no option in this case. The beautiful male was euthanized. It was the landowner that saw this horrible situation, caught up the bird and called for help. Wildlife Rehabilitator, Nicki Christianson, from the WI Rapids area responded for REGI on this case. I cannot say enough about how much Nicki has assisted REGI in Wood And Adams Country. She is amazing! Thanks to everyone. Even if the result was not what we hope for, he is no longer suffering. The weather has cleared somewhat today. It gives us a day to hustle and finish winterizing before winter arrives in earnest. PLUS, we have to watch that important Green Bay Packer game this afternoon.